Susceptibility. Two weeks ago, we published a post on rare variants in SCN9A as potential susceptibility genes for Dravet Syndrome with mutations in SCN1A. Ever since reading the article by Mulley and collaborators, I had tried to come up with an idea of what the genetic architecture might look like if both de novo variants and inherited variants contribute. I wanted to follow up on my earlier post with this brief back-of-the-envelope calculation. Genetic background. The result of the study by Mulley and collaborators was as follows: In patients with SCN1A-positive Dravet Syndrome, we find an excess of rare variants in SCN9A. These variants were roughly five times more common than in controls, and this finding replicated an earlier study with the same result. Theoretically, it might be possible that two events are required to cause Dravet Syndrome: a de novo mutation in SCN1A and a genetic susceptibility. This susceptibility may be interpreted as a genetic background that permits the SCN1A de novo mutation to become penetrant. So far, so good. But is there any evidence for this? And what happens to all the other SCN1A mutations that do not occur on such a “permissive” genetic background. Shouldn’t we see much more of them in control populations? Causality. First of all, I just want to question our concept of causality. Even though we would usually think that causality is a black-and-white thing, we also interpret a high risk for rare events as causal. Take for example asbestos exposure and mesothelioma, a rare lung cancer. You learn in medical school that mesiothelioma is due to asbestos exposure. However, if you look at epidemiological studies, asbestos exposure basically confers a 10-fold risk; it is not a yes-or-no issue. This 10-fold increase in risk for a rare event, however, leaves you with a sense of causal relationship. Likewise, look at long-term cigarette smoking and lung cancer. We would safely say that lung cancer in a smoker is caused by smoking. However, also here there is an increase in risk by the factor of 3-10. While I don’t want to get into discussion about risk versus causality for these examples, I just wanted to point out that our naïve impression of causation is compatible with a range of possible risks. Basically, for a rare event such as a rare disease, all factors that increase the risk by a factor of 10 or more would be perceived as causal. It is much more likely to have the disease than not to have it, if this risk factor is present. This comparison is often expressed as the ratio of the odds and gives you a more direct “feel” for how this risk translates into practice. A range of population frequencies is compatible with the observed frequency in large databases. P(disease|genotype) refers to the probability of developing disease given that an individual has a certain genotype. For the current state of knowledge in Dravet Syndrome, the possible population frequencies make the precise estimate of the probability for disease on the basis of the genotype hard to estimate. This is a dilemma if we want to push the boundary and implement screening programs. Discovery of additional risk factors, either genetic or non-genetic might help to select subgroups of individuals with a particularly high risk. So what about SCN1A? There are large datasets of population controls, demonstrating that disruptive SCN1A mutations are very rare. There is a single disruptive mutation in 6500 exomes in the Exome Variant Server, suggesting that the frequency of these mutations in the general population is between 1:10,000 and 1:1,000. This spectrum of frequencies is fully compatible with what is known about SCN1A in large control cohorts. Dravet Syndrome is a rare epilepsy with a frequency of 1:10,000. If we assume a high frequency of mutations of 1:1000 in the general population, only 1:10 individuals with a mutation in SCN1A would have Dravet Syndrome. This, at first glance, is troubling. We would usually think of SCN1A as a strictly causal event. However, it is dangerous to confuse diagnosis with prediction. SCN1A mutations have a very high diagnostic value and can be found in more than 80% of patients with Dravet Syndrome. Newborn screening. 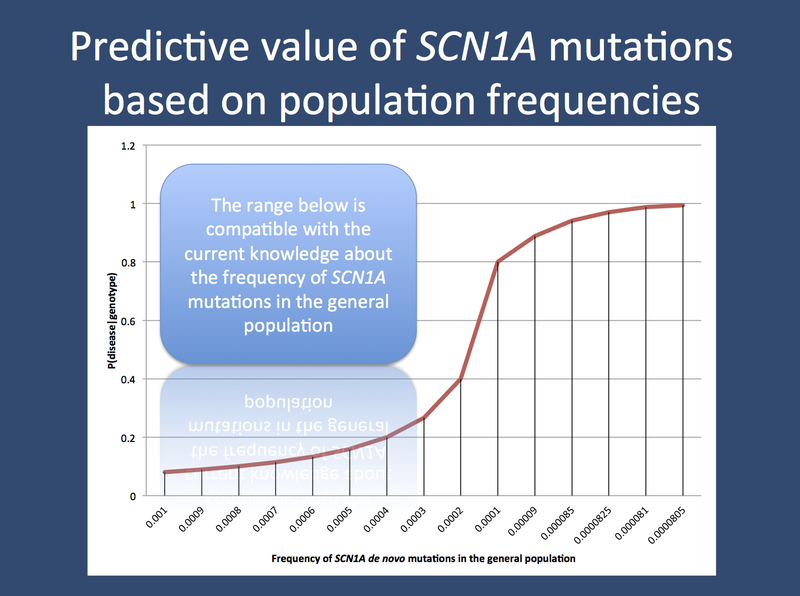 If we screened an entire population and the frequency of disruptive mutations in SCN1A would be 1:1,000, we might find that most people with a mutation would be unaffected. If we assume a lower frequency in the general population of 1:5,000 (f=0.0002), half of all individuals with a mutation would develop Dravet Syndrome. If the population frequency is even lower, SCN1A mutations would be strongly predictive of Dravet Syndrome. Given the difficulty of estimating low population frequencies for genetic variants, this presents a certain dilemma. Rare and sometimes single variants in large population cohorts may be artifacts, but the argument whether mutations in SCN1A are predictive of Dravet Syndrome would rest on this. The NIH currently funds a large project for newborn screening through next-gen sequencing. We currently don’t know if SCN1A would qualify. And this is where possible modifiers come into play. SCN9A. In contrast to the risk conferred by the SCN1A variant, the additional risk contributed by rare variants in SCN9A are minor. However, if we used the combination of SCN1A and SCN9A for prediction, the odds get much better. For example, for a scenario with relatively frequent SCN1A mutation in the population present in 1:1000 individuals, the odds of developing Dravet Syndrome would increase from 1:10 to 1:2. This means that the inclusion of a “minor” risk factor may improve our predictive power. Building a screening program for a condition that only affects 1:10 carriers may seem difficult to implement. Improved odds of 1:2 might be more realistic. Summary. In this post I have tried to argue that the discovery of risk factors for Dravet Syndrome might indicate that SCN1A is not the entire story. De novo mutations in SCN1A are very strong risk factors. However, the magnitude of their effect is hard to estimate due to the inability of precisely estimating rare frequencies in the population. Discovery of additional risk factors may help early diagnosis and screening. Finally, as these genes may hint at novel mechanisms, these factors might also help us find new treatment options. This entry was posted in 2013, Epileptic encephalopathy, EuroEPINOMICS, Opinion and tagged Bayesian model, CACNA1A, control populations, Dravet, exome sequencing, genetic susceptibility, newborn screening, population screening, predictive power, rare variant, risk factor, risk perception, SCN1A, SCN9A, susceptibility genes. Bookmark the permalink.